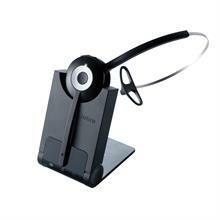 Jabra offers a broad range of products to suit the requirements of any user. From reliable and robust corded and wireless headsets for office workers and contact centres, to sophisticated and stylish Bluetooth® headsets for mobile users and home workers. 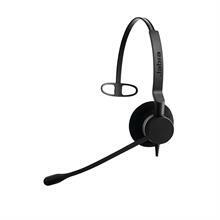 Jabra best in class technology offers users excellent sound quality and comfort. 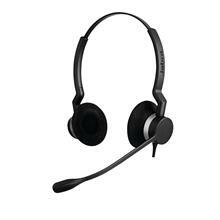 The award winning Jabra Biz™ 2300 series is the perfect choice for users with telephone intense roles. Designed and developed with contact centres and agents in mind, the Jabra Biz 2300’s lightweight and unobtrusive design, including adjustable headband, provides all day comfort. Built with reinforced cord to withstand the contact centre environment, Jabra’s FreeSpin™ technology enables the boom-arm to rotate 360-degrees without risk of it breaking. PeakStop™ removes sudden loud sounds, whilst the superior noise cancelling microphone and HD Voice technology cements Jabra’s world class sound. Jabra Pro™ 900 series is a professional entry-level headset series that offers all the essential features of a wireless headset in a simple design and at an attractive price point. Optimised for use with all leading deskphones and softphones, the Pro™ 900’s noise-cancelling microphone filters out background noise for clearer calls and less repetition. Jabra’s HD Voice technology additionally equips the plug and play device with world-class sound. A long-distance range of over 100 metres and 12 hours worth of battery ensures wireless working is done at its best. 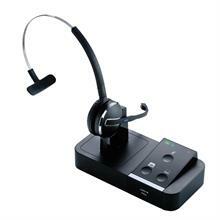 An ideal choice for blended telephony environments, the Jabra Pro™ 9450 dual connectivity headset is a user-friendly, no frills device which provides office staff with a convenient and straight-forward interface to handle calls from both their desk and UC softphone. The noise-cancelling microphone provides unbeatable sound that can be unlocked in a matter of minutes with the Interactive Setup wizard, whilst free software upgrades via Jabra PC Suite ensures the headset is a future-proof investment. Enabling users to handle calls directly from the headset, via their computer or the touch buttons on the base, the Jabra Pro™ 9450 provides an opportunity for everyone to benefit from true wireless working.